Peracetic Acid or Peroxyacetic Acid is a strong oxidizer useful for high level disinfection and sterilization. Hospitals and Food Handling / Food Processing industries commonly use Peracetic or Peroxyacetic acid, in concentrations that can be harmful to workers if they are exposed. The Environmental Protection Agency (EPA) has issued Acute Exposure Guidelines (AEGL) for Peractetic Acid. AEGL-1 is the airborne concentration of a substance above which it is predicted that the general population, including susceptible individuals, could experience notable discomfort, irritation, or certain asymptomatic nonsensory effects. However, the effects are not disabling and are transient and reversible upon cessation of exposure. AEGL-2 is the airborne concentration of a substance above which it is predicted that the general population, including susceptible individuals, could experience irreversible or other serious, long-lasting adverse health effects or an impaired ability to escape. AEGL-3 is the airborne concentration of a substance above which it is predicted that the general population, including susceptible individuals, could experience life-threatening health effects or death. For Acetic Acid, the OSHA exposure limit is a PEL of 10 ppm and ACGIH has established an 8 hr TWA TLV of 10 ppm and a STEL of 15 ppm. The health affects from exposure to Peracetic Acid are known. The EPA has established exposure limits based on the toxicity to humans and the OSHA / ACGIH have established exposure limits for the 2 main ingredients (Hydrogen Peroxide3 and Acetic Acid4,5). 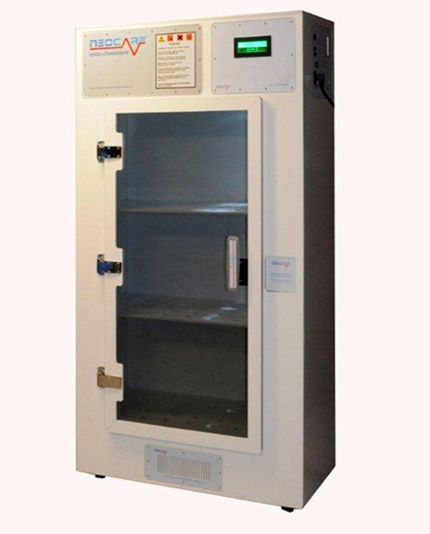 A dedicated storage cabinet for Peracetic / Peroxyacetic Acid can help protect employees from the acute and chronic health effects by providing a bunded area to contain any spills and by removing the airborne PAA, emitted from the vented containers or a spill, before the air is circulated into the working environment. In addition any spill is communicated to the staff by visual and audible alarms, alerting them to adorn PPE before opening the cabinet providing proactive protection. Many employers whose workers have experienced symptoms of exposure and expressed concern are looking for solutions. Correct storage along with a comprehensive education program and safe work practices are the best ways to assure worker safety and maximise productivity. 11,12,13,14United States National Library of Medicine: Toxicology Data Network: http://toxnet.nlm.nih.gov/cgi- bin/sis/htmlgen?HSDB (search for “Peracetic Acid” then click Peracetic Acid search result #1).